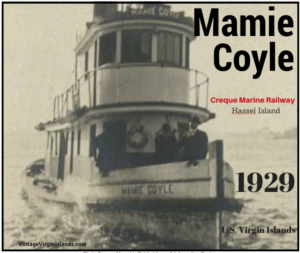 By 1905, the Marine Repairing slip on Hassel Island was dilapidated and in desperate need of repair. 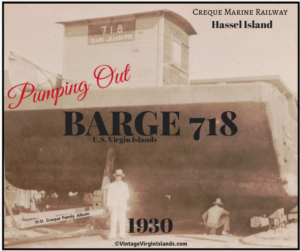 Vital rails needed to haul the vessels were in such deplorable condition, that one would hardly believe the property was once a bustling, vibrant beehive of activity. For four years, there were advertisements in the local papers for its sale, lease or rental. 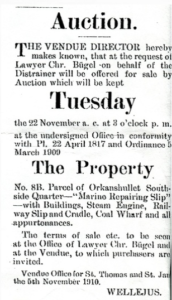 Our great-great grandfather was intrigued when he saw the ad for its upcoming auction in the November 12th edition of the St. Thomae Tidende. 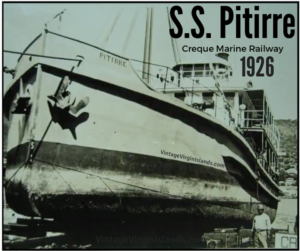 At the time, Henry O. Creque was the owner of an ironmongery business and was the agent for many of the inter-island vessels. 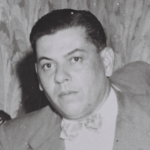 Born in Anegada as the son of a mariner, he often accompanied his father as he salvaged vessels from the grips of the largest barrier reef in the Caribbean. With his background, he believed he had the fortitude to bring the railway back to its former glory. After considerable thought, Henry submitted a sealed bid to the auction house for the nine-acre property. His maximum offer was $7,000 or 35,000 francs, with the provision that it be protected against auction expenses. When the initial payment was due, days after the knock of the hammer, Henry was surprised to see extra interest, auction and attorney fees added. He contested those charges vehemently but later paid them under protest. He noted his unsatisfactory correspondence with the Board; (Mr. Carl V. Labeet, Mr. Max E. Trepuk, Mr. L.E. Stakemann and Mr. Charles Bugel Esq. ), except for Mr. L. Delinois who had not lent his signature to the board’s correspondence with him. 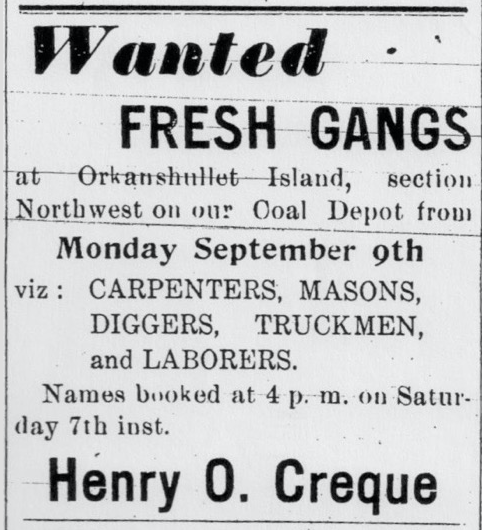 By November 22, 1910, Henry's offer was the only genuine offer proffered. At the following shareholder's meeting, it was approved by the board members. 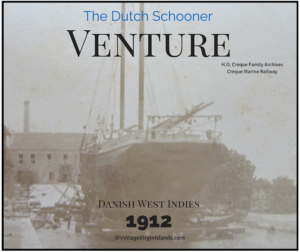 The National Bank of the Danish West Indies financed the purchase. With the bond secured, Henry received the survey drawings which included the detailed descriptions of the rail levels. With this information, the massive renovation project began. Single side rails in 10ft lengths, middle and side carriages were ordered from the British Engineer's Import Agency in London. 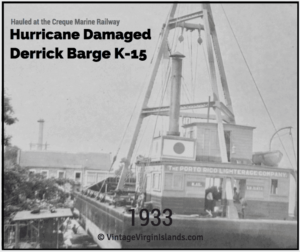 In April of 1912, after many months of repairs and upgrades to the docking cradle, the business opened. 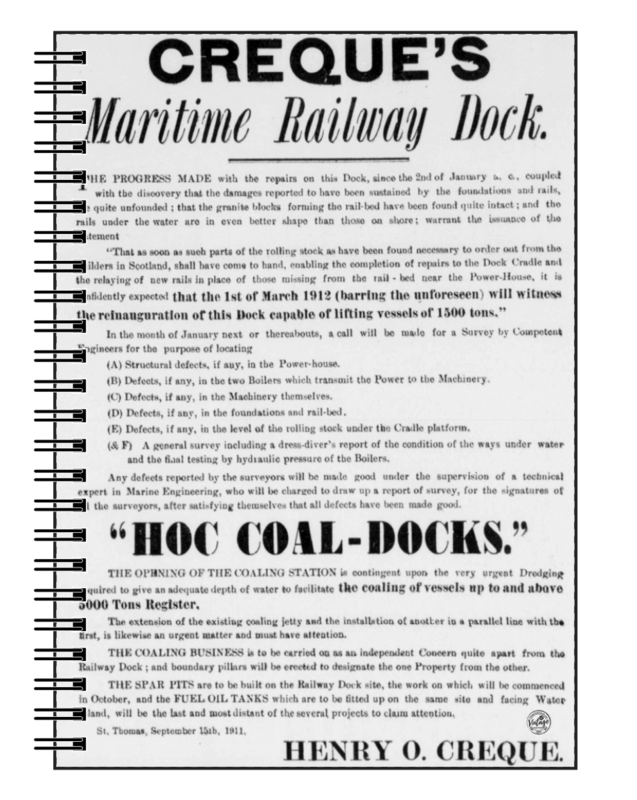 Advertisements in the newspapers encouraged boaters to avail themselves of the railway's services, which included general boat repair and maintenance. Henry was very proud of his accomplishment. 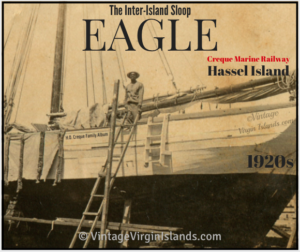 There wasn't a railway slip dock on the entire American Atlantic Seaboard south of Norfolk and extending down to Texas, which could be compared with this one on Hassel Island. When it came to substantiality in construction, nothing could compare with the Power House, which was built for perpetuity. Vessels of every nation sought the services of the newly renovated railway. It was conveniently located and very approachable. 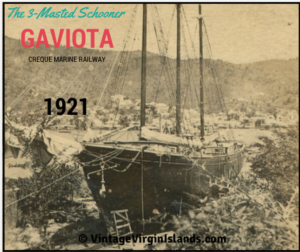 Schooners, sloops, brigs, army boats, barges, yachts, patrol boats and huge tankers were all pulled up onto the rails. The heavy chains leading from the steam-powered engine room at the top of the ramp did the job. The rattling, splashing, whistling, humming and pounding started at daybreak and continued throughout the day. A never-ending circle of activity surrounded each vessel on the way. 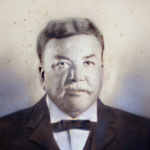 On June 23, 1915, three years after opening, Henry died. Herman inherited the railway and continued in his father’s footsteps, until his untimely passing on January 29, 1949. The property was then bequeathed to his wife, Emily, and later their five children. 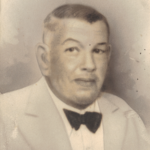 Their son, Henry O. Creque Jr. operated the business for a short time. After Henry's passing in 1957, the property languished for a number of years, until in 1978 it was sold to the Federal Government. 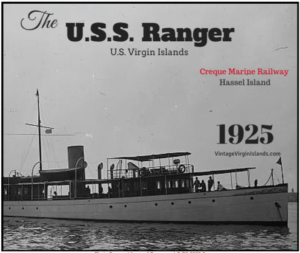 It now forms part of the Virgin Islands National Park. 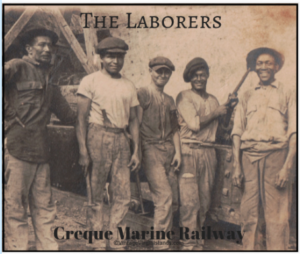 For three generations, the Creque family documented the railway's rich history as it unfolded! Their albums with faded photographs and boxes of fragile files hold the keys to its legacy. Through those yellowing bits of paper, forgotten yachts told their stories. Their names, their captains, arrival dates, repairs, paint colors and payments were all revealed. In its heyday, the railway was a prosperous enterprise! 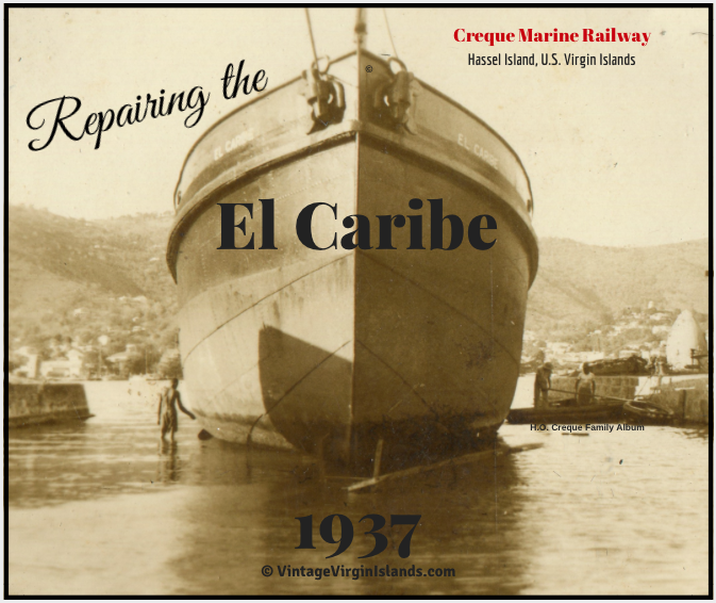 It was a place to meet new and old friends, negotiate contracts and float memorable vessels that no longer criss-cross the Caribbean sea. Today, those keepsakes stand as a testimony to the family's own legacy of their love and dedication. 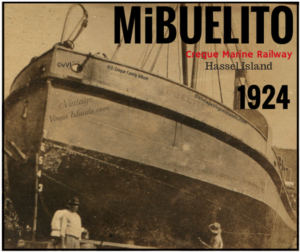 They restored and operated one of the oldest, steam-powered, marine railways in the Western Hemisphere. Click on the links for the stories! 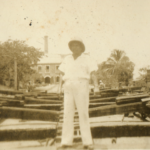 During the early 1900s, the sloop, EAGLE traveled between the Danish West Indies, Tortola and San Pedro de Macoris in the Dominican Republic. 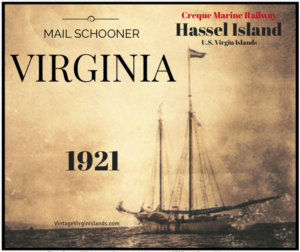 The mail schooner, VIRGINIA was originally built in Curacao in the Dutch West Indies. 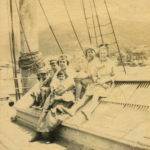 In August 1937, a Texas Oil tanker damaged its hull when it hit a coral reef at Saona Island off the southeastern tip of the Dominican Republic. 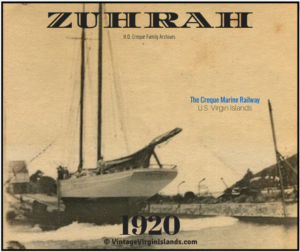 The ZUHRAH, captained by the beloved Samuel Sewer during the 1920s, was an important link in the inter-island trade. 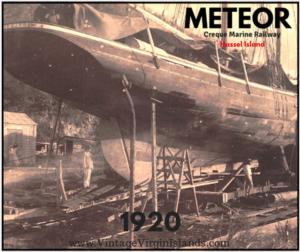 Today marks the 96th anniversary of the arrival of the vessel, METEOR, at the railway. 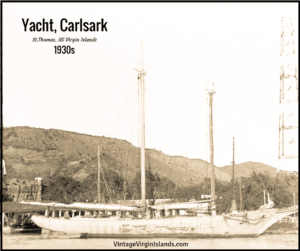 Copyrighted © 2018 Vintage Virgin Islands, Ltd. All Rights Reserved. Reproduction, Reuse or Distribution of any images or content without written permission is Prohibited. Thank you to three generations, (Henry, Herman and Henry Creque Jr.) for documenting and preserving the incredible history of the railway. More incredible discoveries to come! See more on the Etsy Shop! 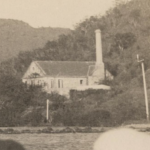 Wonderful video on the History of Hassel Island. 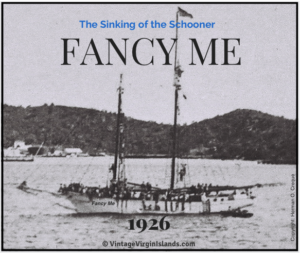 Copyright © 2015 - 2019 Vintage Virgin Islands, Ltd. All Rights Reserved.